Note: This card can use up to three drives, and can use SSSD (90K) and DSSD (180K) drives. It can NOT do double density. TI DISK MEMORY DRIVE — The disk drive reads information from and writes information on the diskette. It can rapidly locate any position or file on the diskette as directed by the Disk Drive Controller. The disk drive spins the diskette at a constant speed and controls the movement of the magnetic head. You may have one of two drives that have slightly different appearances. However, they function in exactly the same way. Note: At present, only single-sided disk drives (Model PHP1250 and PHP185O] are available for use with the TI Disk Memory System. These drives utilize 5¼ inch single-sided, single-density diskettes only. For reference, however, this manual and the Disk Manager Command Module include information about double-sided, double-density diskettes. TI DISK DRIVE CONTROLLER — The Disk Drive Controller, which can control up to three disk drives, tells the disk drives where to position the magnetic head in order to read or write information properly. The controller also puts an index on the disk, making the data that has been written easy to locate. 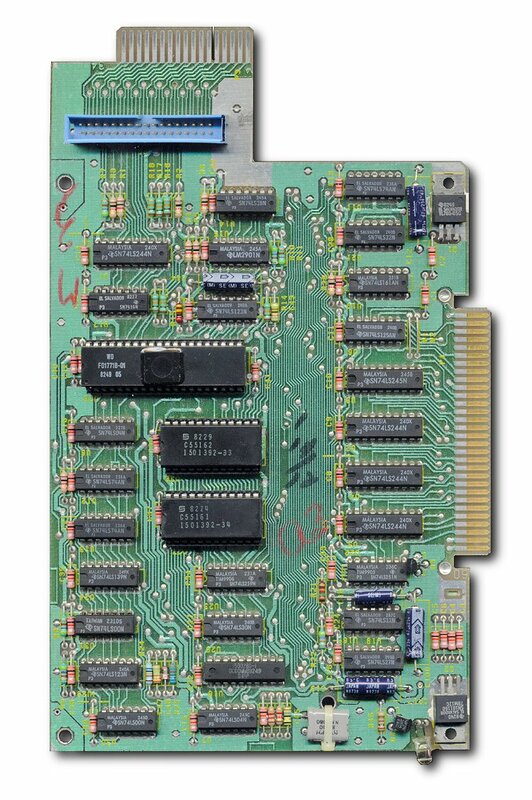 DISK MANAGER COMMAND MODULE — The Disk Manager Solid State Software7M Command Module, packed with the Disk Drive Controller Card, helps you maintain the information on your diskettes. Initializing, naming, and renaming diskettes, renaming files, deleting files, copying files, and copying diskettes all can easily be performed with the Disk Manager module plugged into the computer console. The Texas Instruments disk system represents a major advance over other systems. Because the control software needed for the disk system Is in permanent ROM, In the Disk Manager Command Module and in the controller, the disk system uses a relatively small amount of working space in the computer’s available memory (RAM). The Disk Manager Command Module provides many advanced functions. For instance, in copying a diskette, it rearranges the files on the diskette alphabetically. And, If you like! you can copy selected flies instead of an entire diskette. These and many other unique features of the disk system are described In this manual. Get the most from your disk system by first reading this manual and performing the examples as you go. Also, review the appendices for special Information and applications. Then use the disk system with your own applications. The TI Disk Memory Drive and the TI Disk Drive Controller are sold separately.